This Comfort Fit subtle bootcut pant fuses polished style with unparalleled comfort featuring a pull-on high-rise waist, faux front and back pockets, and back darts for a flattering, tailored fit. Built-in power mesh panels at the waist smoothes you in all the right places. Slimming Stretch: This sleek, 4-way stretch fabric gives you the feel of your favorite yoga pants with a chic, professional look. Crafted with a high percentage of Nylon and Spandex, it holds you in all the right places and offers superior stretch and recovery without bagging at the knees or seat. Inseams: Regular 32.0", Short 30", Long 34"
We designed Lark & Ro pants to make you feel confident, empowered and ready for anything. We'd like to hear about your experience so we can continually improve our collection. This Comfort Fit subtle bootcut pant fuses polished style with unparalleled comfort featuring a pull-on high-rise waist, faux front and back pockets, and back darts for a flattering, tailored fit. 4-way stretch fabric gives you the feel of your favorite yoga pants with a chic, professional look. Crafted with a high percentage of Nylon and Spandex, it holds you in all the right places and offers superior stretch and recovery without bagging at the knees or seat. Inseams: Regular 32", Short 30", Long 34"
Curvy fit is built for a smaller waist and fuller thigh. 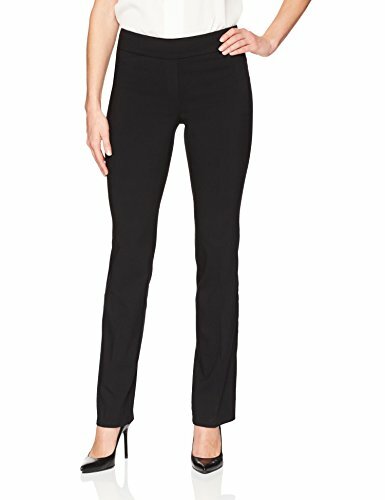 This pant is perfect for a woman with an hourglass shape; minimizing gaping at back waistband. We recommend searching for our Classic and Comfort fit pants to find your perfect fit. Casual Stretch: The classic twill gabardine fabric has a subtle give and is refined with a soft, easy feel that beautifully drapes the body. Looking for more stretch? 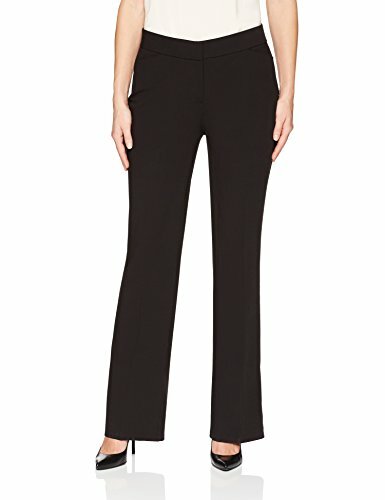 Try searching for "Lark & Ro Women's Plus Size Straight Leg Stretch Pant: Comfort Fit"